Detecting phishing websites has been noted as complex and dynamic problem area because of the subjective considerations and ambiguities of detection mechanism. 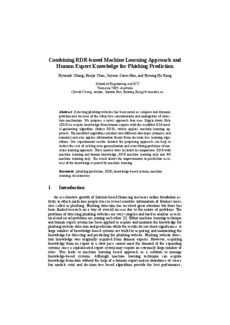 We propose a novel approach that uses Ripple-down Rule (RDR) to acquire knowledge from human experts with the modified RDR model-generating algorithm (Induct RDR), which applies machine-learning approach. The modified algorithm considers two different data types (numeric and nominal) and also applies information theory from decision tree learning algorithms. Our experimental results showed the proposing approach can help to deduct the cost of solving over-generalization and over-fitting problems of machine learning approach. Three models were included in comparison: RDR with machine learning and human knowledge, RDR machine learning only and J48 machine learning only. The result shows the improvements in prediction accuracy of the knowledge acquired by machine learning.